Reproduction of the original chrome headlamp bezels for use on 1979-81 standard Firebird models. Manufactured from original GM tooling. 4 required. OER reproduction of the stainless steel center cap for Pontiac Snowflake wheels for 1977-79 Firebird and Trans Am models. Beautifully reproduced to exact factory specifications. Sold individually. 4 required per vehicle. Black 100% cotton T-shirt with yellow silk screened trademark OER® logo. Replace your cracked, shrunken or worn out shackle bushings and bring your rear suspension back to original factory ride specifications. Set includes 8 bushings. Note: No further discounts apply. Replace your trunk weatherstrip and stop leaks which could cause severe damage and rust to your trunk pan and entire trunk area. When installed, your trunk will be water tight and completely sealed when shut. Reproduction of the trunk lid seal for all1 975-79 GM X-body models.This trunk weatherstrip is made of EPDM rubber with a molded retaining channel that slips over the edge of the trunk opening. Note: Not for use on hatchback models. Applications Chevrolet Nova Buick Skylark Oldsmobile Omega Pontiac Ventura Pontiac Phoenix Note: Installs using 3M brand Super Weatherstrip Adhesive, part # 08008. 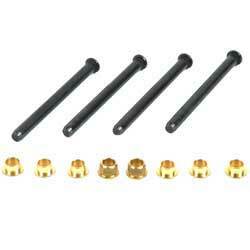 Each door hinge repair set includes 4 pins and 8 bushings to repair all 4 hinges on one vehicle.